Last night was Moonlight Party 6, a Sailor Moon themed streaming party put on by Viz. 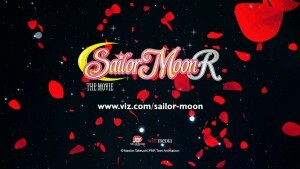 Their big announcement was that Sailor Moon R The Movie, the first of three Sailor Moon movies, will be dubbed by Viz and released in theatres in January. The “Make Up! Sailor Guardians” short will also be included. Watch the announcement trailer embedded below. The trailer doesn’t include the date, which was mentioned in the streaming event, but January is mentioned in the video description and that date was confirmed by the official North American Sailor Moon Twitter account. The film will be released in English and in Japanese with English subtitles. 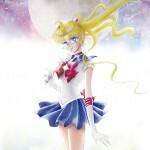 The main cast who are voicing the new Viz English dub of the original Sailor Moon anime and Sailor Moon Crystal will be reprising their roles in this movie. The new character of Fiore will be voiced by Ben Diskin. He previously provided the voice of Umino in the series. You can watch a clip introducing him below. Viz will be making an HD remaster of the movie for this theatrical release. 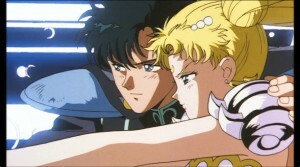 The Japanese DVD release was remastered from the original film source. While it is possible Viz does the same its more likely they had access to standard definition DVD source material which they are transferring to HD using software. Its hard to tell exactly from the trailer but it seems based on the quality of that video that this is the case. 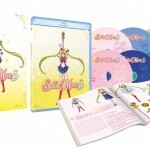 Since the video quality of the Sailor Moon movies in the Japanese and international releases has been superior to those of the TV series, we can expect better quality that what we’ve seen for the Viz releases we’ve seen to date. 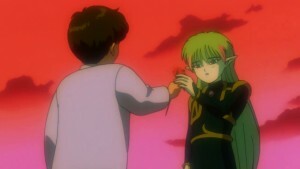 Sailor Moon R The Movie tells the story of Mamoru’s friend Fiore who attacks the world along with the Kisenian flower. Though it is not explicitly mentioned Fiore is clearly from the same alien race as Ail and An. 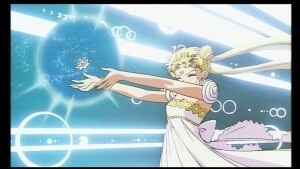 It was originally released in December of 1993 and, although the movies are hard to place in continuity, takes place near the end of Sailor Moon R. Though it was originally dubbed back in 1999 it has long since been out of print, with the rest of the Sailor Moon films. “Make Up! 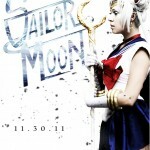 Sailor Guardians” is a short video which originally played with the film in theatres. It was never released in North America though it was released on laserdisc and DVD in Japan. 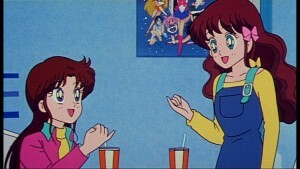 The basic story of this has Usagi and Chibiusa sitting in a cafe overhearing some girls talk about the various Sailor Guardians as we see clips from the first two seasons. There is some new animation but most of it is a rehash of stuff we’ve seen before. Some music included in this special was released on CD but not seen elsewhere in the series. 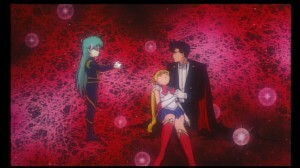 Perhaps the reason Sailor Moon R The Movie is so hard to place in continuity is because it itself takes place as a fictional movie within the world of the Make Up! 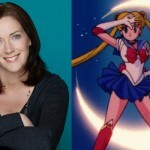 Sailor Guardians short which is itself questionably in continuity with the series. 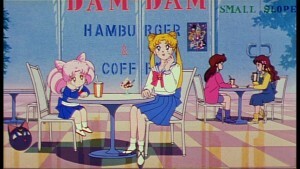 Wouldn’t everyone find out who Sailor Moon is when they watch the film that is clearly advertised on a poster in the Dam Dam Hamburger and Coffee restaurant? Why do these girls have such a hard time remembering all of the characters when they are all clearly shown in this poster a few feet from their table? Do they not recognize Chibiusa who is clearly featured on the poster and even has Luna P with her? I’ve always considered Sailor Moon R to be my favourite of the Sailor Moon movies and one of my all time favourite films. I’ve always dreamed of seeing this movie in theatres and am thrilled to finally have a chance. It is likely this movie will have a limited release. We will share updates about when and where you can watch the movie as they become available. 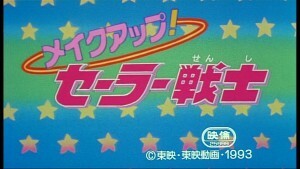 The Moonlight Party was partially meant to promote the upcoming release of Sailor Moon S part 1 on home video. It will be released in stores and online this Tuesday November 15th. Support the site by ordering your copy from Amazon using the links below. 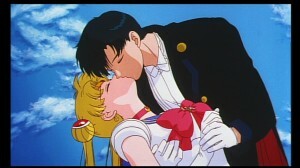 This entry was posted in Sailor Moon Anime (1992) and tagged Make Up! 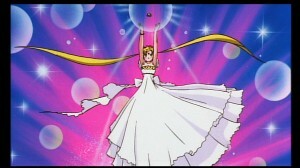 Sailor Guardians, Moonlight Party, Sailor Moon R The Movie, Viz, Viz English Dub by Adam. Bookmark the permalink. Hmm, wonder if they’ll have the Moon Revenge song in this film. Before in the series they used all the Japanese music. Also, wonder when I will be able to buy it on blu-ray/DVD? Well, we all saw this coming. 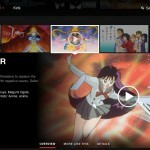 Now we just need to know when Sailor Moon S gets to Hulu. I would guess after all of S is dubbed and released. Might depend on how this one does. I hope this will be in the theater near me and that I’ll have enough money to go see it. It will be a new dub with the new voices that you’re heard on Hulu. Has anyone else seen the new Ford ad that uses Sailor Moon footage and the Viz cast? It’s funny and actually real! So cant get used to the new voices but will like to see it on the big screen. I basically NEED – ALL S.M. of ALL TIME. EVERYTHING! Who’s with me? Who has it…where do I find it…how do I get it? Obsessed! Sorry to sound like a Sailor Hipster, but I’m very glad that the original Japanese track with subtitles is an option. It wouldn’t have been a dealbreaker for me if there was only the new dub, but it’s a cool gesture, I think.